Guru Singh recalls a decision that changed his destiny, and ours. "What is that?" I heard a huge voice behind me asking, as I sanded an antique Thonet bentwood chair. I turned to see Yogi Bhajan, my new teacher, towering over me with a most inquisitive stare. "It’s my turban, Sir," I responded with great enthusiasm. It was actually a scarf that I’d managed to wrap enough times around my head so as to capture all the curls of my unmanageable hair into one well-mannered clump. "Why you’re doing that?" he continued to question. "To be like you," I replied, surprising even myself. "I want what you have." "Wow!" he said with a huge grin, "For you to cap an ego like that, it’s really something. Let’s see what it brings." He was right. This was huge for me. As a professional musician my mountain of long curly hair was an identity; it was part of my personal and professional image. To cap and wrap it under a turban had been very impulsive, but also a bit courageous. After all, Warner Bros. Reprise Records had me under contract and I was hearing talk about being the next Dylan/Donovan. 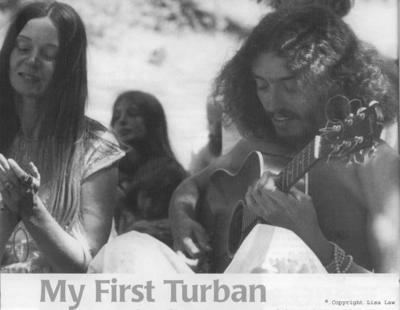 So how then did I become Yogi Bhajan’s first student to tie a turban? I initially tied it to stop lacquer spray and sawdust from creating cement in my hair, and Yogi Bhajan was the reason I was working on that chair. A few weeks earlier, just a month after starting yoga, I had attended a birthday party for Jules Buccieri who owned the antique store where 3HO began. Yogi Bhajan needed a place to teach Kundalini Yoga in Los Angeles in January 1969-Jules offered his store. When it was time for class (before and after store hours) we would empty the furniture into the parking lot and do yoga on the antique Persian rugs. That night at the party Yogi Bhajan asked me where it was that I worked and I told him proudly that I didn’t. I was a musician. "That’s very well," he said to me, "but you need to learn to work too." I looked back with disbelief. This was the teacher who appeared in my life after I spent nine months in the Mexican wilderness with an indigenous Shaman. This was the teacher who the Shaman told me I would meet. He said to go and find the "Great One!" And now this "Great One" was telling me to get a job? "If you want to understand the teachings, you’ll have to understand the students," Yogi Bhajan smiled. "Most students aren’t musicians, they work; they have jobs." He laughed and turned to Jules Buccieri. "Hire this ‘music-man’ on the spot," he said, and I began sanding and painting antiques the very next day. That was the beginning of a journey now thirty-six years in the making; a journey of creating a teacher, minister, husband, and father out of a musician who now uses music to teach. Once I discovered how a turban made me feel, the reasons quickly changed from protecting my hair to connecting my brain. I found the turban that wrapped and held my head both focused and calmed my mind. I was a different person with it on. A long time has passed since the initial dust and spray, the surprising bonus of focus and calm. What really made me tie that turban were faith, trust, and admiration for a teacher. What’s resulted from it has been monumental. Years later, Yogi Bhajan says to me, "We had no idea, did we Guru Singh, where tying a turban was going to lead?" "Not at all," I answer. Yogi Bhajan and Guru Singh, Peace Prayer Day 1998. Guru Singh Khalsa is a yogi, teacher, musician, author, and Minister of Sikh Dharma, living in Los Angeles with his wife; they have two children. On January 10, 1969 Guru Singh began studying Kundalini Yoga with Yogi Bhajan and now teaches at Yoga West in Los Angeles and Miri Piri Academy in Amritsar, India. What a wonderful life story – Guru Singh you are truly blessed by the Almighty to have had the sangat of some enlightened souls. To have met the Shaman who planted the seed for your re-awakening and then to meet Yogi ji – That can’t just be coincidence! May Waheguru always be with you. guru fateh world is going to be a khalsa panth soon i can say that proudly. 114230858404535022 - Hours later in the day...the snow is all melted. This is the way it is here in NM. Doesn't seem to stick for more than a few hours.